Tulsi Gabbard Promotes Praise From Tucker Carlson - Joe.My.God. 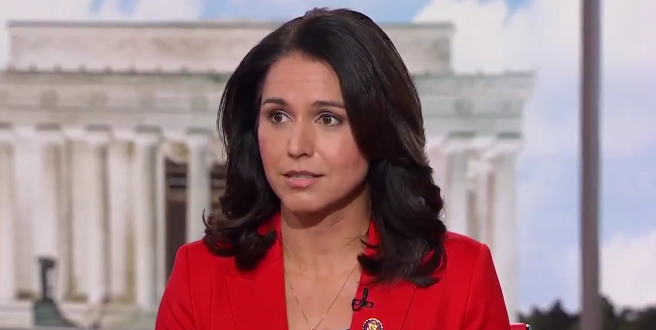 Aside from her low 2020 name-recognition, Gabbard is also loathed by many Democrats. That’s thanks to her questionable past position on gay marriage and brilliant decision in 2017 to go on an unsanctioned “fact finding” trip to visit mass murderer Bashar al-Assad in Syria — only to return with pro-regime talking points. It makes sense, then, that Gabbard would seek unconventional ways to get her message out. One way that’s going to get her 0 points with the Democratic primary voters she needs to win over? Touting praise from Fox News host Tucker Carlson, who interviewed her on his show Thursday night.